I’m Gretchen Jordan. I’ve been doing logic modeling and writing and teaching about how to develop them for more than 20 years. I find the process stimulating and fun, and have noticed that the more I do logic models, and the more I learn about the subject matter, the easier it is and the better the model. However, most people do not do multiple logic models in one subject area. 1. Generic logic models can be a huge help in evaluation. Evaluation frameworks with a well explained generic logic model and accompanying indicators, building on deep subject matter expertise, can be a huge help to evaluators or program staff. With this as a guide, they can work through a logic model and evaluation plan tailored to their specific program. These generic guides save resources and improve the quality of evaluation studies. If used for a group of related programs the common framework for collecting and analyzing data sets up the possibility of synthesis of findings across those programs. This can point to features of an intervention that matter most and that are not otherwise visible. Example. The Research, Technology and Development (RTD) Topical Interest Group of the AEA has written a paper “Evaluating Outcomes of Publicly Funded Research, Technology and Development (RTD) Programs: Recommendations for Improving Current Practice.” Central to the paper is a generic logic model and table of indicators that could guide evaluation planning for many different types of RTD programs. 2. A generic logic model reflects knowledge of the big picture. Logic modeling is a management and evaluation tool to develop a succinct picture of a program’s goals and the strategies for achieving these within a broader context. It requires a real understanding of the program and its context. This knowledge can come partially from documents (including assessments of similar programs) but ultimately the best information comes from program managers and staff sharing different perspectives and perceptions. Example. The generic logic model in the RTD TIG paper builds on existing theories, evaluation studies, and other generic logic models. 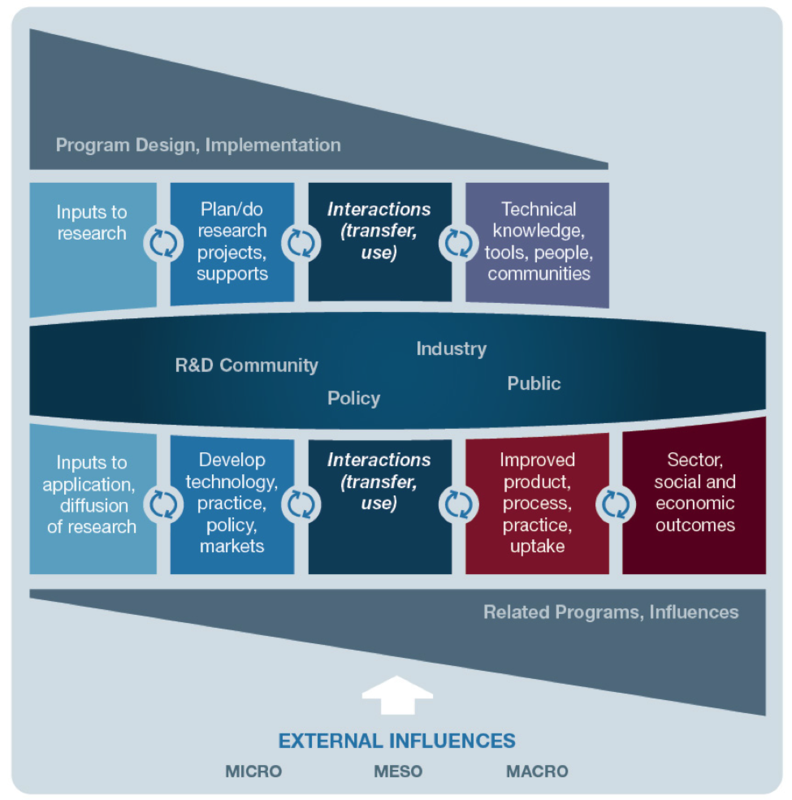 The diagram shows two major areas of RTD, research and application of research, to reflect the reality that these are often done by different organizations and evolve over a considerable length of time. The interactions between the two streams occur with four main areas: RTD community, government/policy entities, industry, and public groups. At the top left of this model is the essential step of program design and implementation. At the bottom, related programs and influences are called out in addition to three levels of other external influences (micro, meso/sector, and macro). I am Brady Miller, a graduate student new to world of program evaluations. The whole process can be a little intimidating and overwhelming for a newbie researcher. However I have discovered that logic models are critical to mapping out the process for conducting projects. I agree that it is useful as a guide to tailor the evaluation plan for a specific program while allowing the evaluator to remain focus on the big picture. It provides a strategic element to completing program evaluations, very useful.